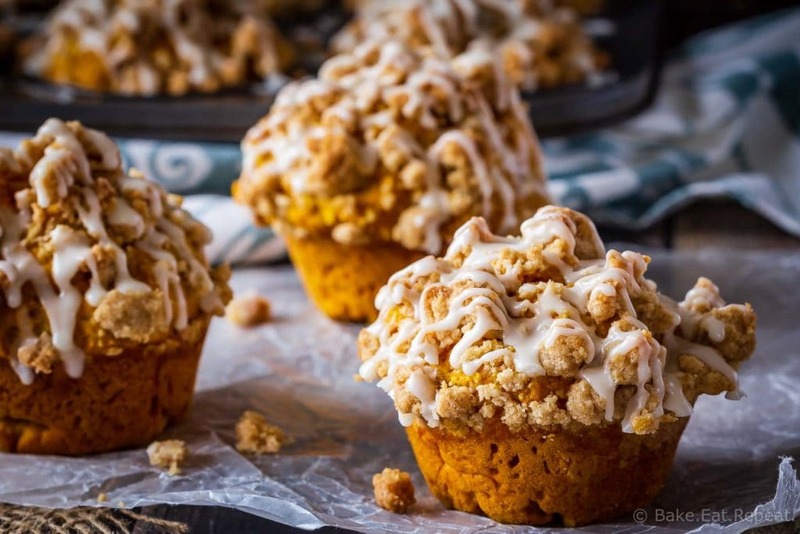 These bakery style pumpkin spice muffins are delicious on their own – but add that crumb topping and drizzle them with a maple glaze and they’re amazing! 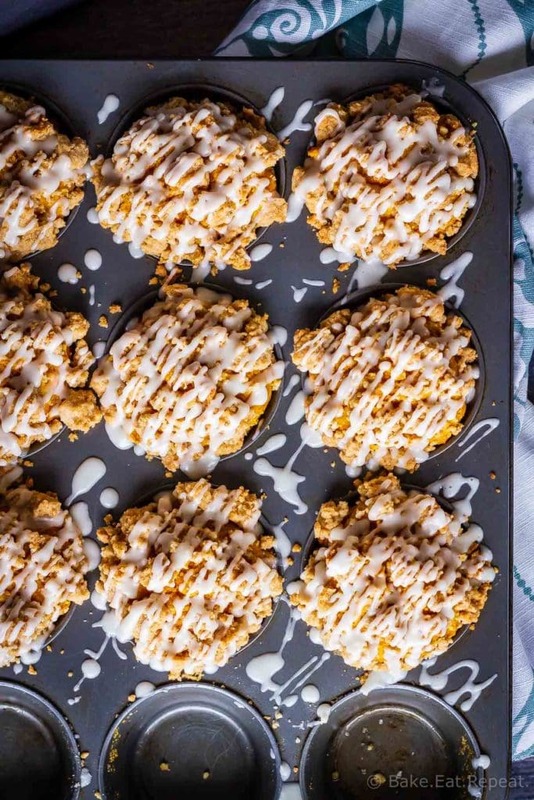 These apple muffins with a crumb topping are one of the most popular recipes on my website. They’re also one of our favourites. When I want a sweet, bakery style muffin, those muffins are often the ones I make! So clearly I needed a pumpkin spice version. Pumpkin spice muffins are one of my favourites in the fall. Adding a tasty crumb topping and a maple glaze just makes them even better. 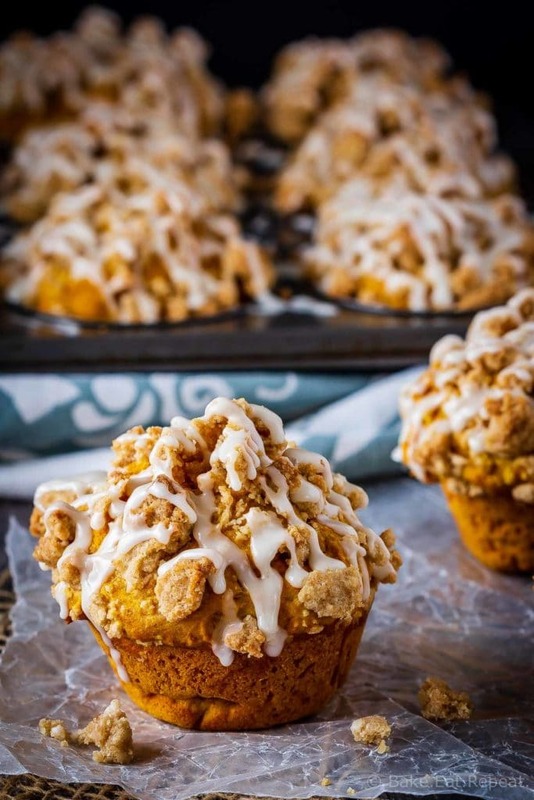 These pumpkin spice muffins with a crumb topping mix up very quickly. No special equipment needed for this recipe. Just a couple of bowls and a spoon and you’re good to go. Well, and a muffin tin of course. You can even enjoy these pumpkin spice muffins without the crumb topping if you’d like. Skip those added steps of making the crumb topping and maple glaze if you want. These muffins are delicious with or without the crumb topping. But my vote is to leave it on. Because if you’re going to make a bakery style muffin, you might as well go all out! How do you make crumb topping for muffins? It’s super easy to make a crumb topping for muffins. Just a few ingredients and about thirty seconds to mix them together is all it takes. This crumb topping uses brown and white sugar, flour, cinnamon, and melted butter. Place all the ingredients in a small bowl, and stir until it starts to clump together. 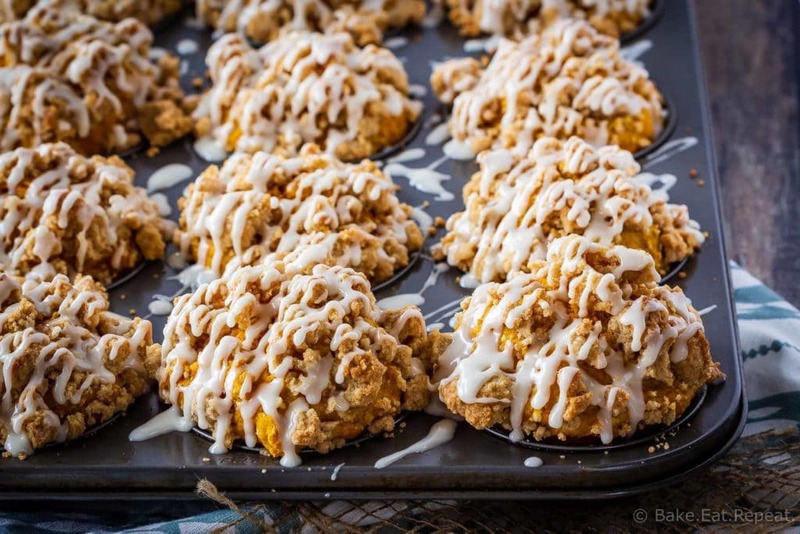 If you squeeze the crumb topping mixture in your hands as you put it on the pumpkin spice muffins, it will clump together so you get those nice big crumbs on top. Can you use canned pumpkin pie filling instead of pumpkin puree? This recipe, and most pumpkin spice muffins recipes, call for pumpkin puree. Pumpkin puree is not the same as pumpkin pie filling – although the cans look the same! Make sure you’re getting the kind that is labelled “pure pumpkin”. Pumpkin pie filling is already flavoured with all the spices for pumpkin pie, so the pumpkin spice muffins will not taste the same if you use that. How do you make pumpkin muffins with fresh pumpkin? If you’re using fresh pumpkin for these pumpkin spice muffins instead of canned pumpkin it will still use the same amount. You will need to cook the pumpkin, puree it, and strain it before using it to bake with. I like to roast fresh pumpkin because it’s easy. Cut it up into pieces, scoop out the seeds and roast it until it’s tender. Then you can simply scoop the cooked pumpkin flesh out of the skin. Trying to peel it before cooking it is just an exercise in frustration! Do make sure to strain your fresh pumpkin before baking with it as it has a lot more liquid in it then canned pumpkin does. It doesn’t matter quite as much for something like pumpkin spice muffins, but if you’re making pumpkin pie it won’t set up quite as well if you don’t strain it well. I love using this stoneware muffin tin for baking muffins. If you have one of those, keep in mind that the muffins usually need to bake for about 5 minutes longer in it. The recipe is written for a standard muffin tin. I find the best way to scoop the muffin batter into the muffin tin is to use an ice cream scoop or large cookie scoop. It portions out the batter evenly and helps with getting those nice domed muffin tops. You can make these pumpkin spice muffins without the crumb topping and glaze if you like. The bake time will be the same. 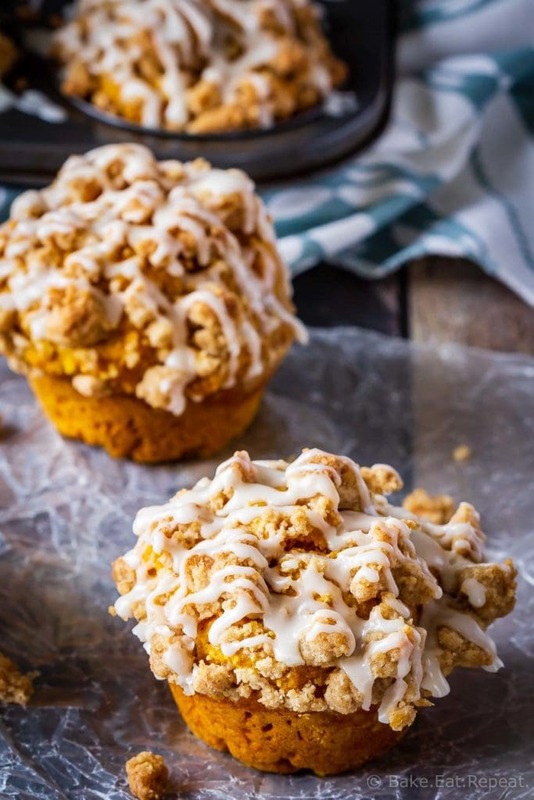 These bakery style pumpkin spice muffins are delicious on their own - but add that crumb topping and drizzle them with a maple glaze and they're amazing! Preheat the oven to 425 degrees F. Lightly spray a 12 cup muffin tin with non-stick spray, or line it with paper liners and set aside. Make the crumb topping - in a small bowl, combine the sugar, brown sugar, flour, cinnamon and salt. Drizzle the melted butter over everything and stir until everything is combined and clumping together. Set aside. In a large bowl, whisk together the pumpkin, milk, oil, eggs, and brown sugar until well combined. In another bowl, whisk together the flour, baking soda, baking powder, salt, cinnamon, and pumpkin pie spice until well combined. Add the pumpkin mixture to the flour mixture and stir until just combined. Scoop the muffin batter into the prepared muffin tin, dividing it between the 12 muffin cups. They should be almost full. Top the muffins with crumb topping, dividing the mixture between the 12 muffin cups, and lightly press it into the muffin batter. Bake for 5 minutes, and then lower the oven temperature to 350 degrees F and continue baking for another 15-18 minutes, or until a toothpick inserted in the center of a muffin comes out clean. Allow the muffins to cool completely in the muffin tin. The crumb topping is less likely to fall off if you wait to take them out until they’re cool. In a small bowl, whisk together the powdered sugar, milk, and maple syrup until smooth to make the glaze. Drizzle the glaze over top of the cooled muffins. Source: Adapted from my Apple Muffins with Crumb Topping .